WARNING: Not compatible with "full-frame" (35mm size) cameras. Capture subjects both near and far with the vast zoom range of the DT 18-250mm f/3.5-6.3 Lens from Sony. Designed specifically for APS-C A-mount cameras, this lens is able to deliver an impressive 27-375mm equivalent zoom range. The optical design even incorporates two extra-low dispersion elements and two aspherical elements to combat aberrations and flare. Along with this, the lens features a zoom lock switch to prevent lens creep when not in use while an internal focus design helps provide a minimum focus distance of 1.5'. Additionally, it has a seven-blade circular diaphragm for smooth bokeh. Covering wide-angle to super telephoto perspectives, this 18-250mm zoom is designed for APS-C format A-mount cameras, where it will provide a versatile 27-375mm equivalent focal length. A variable f/3.5-6.3 maximum aperture helps ensure that lens size and weight is kept to a minimum. 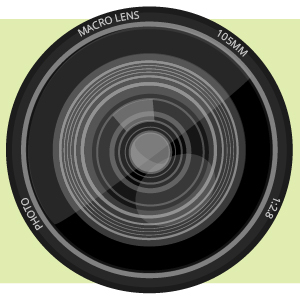 The internal focusing design helps to ensure smooth fast autofocus as well as enables a minimum focus distance of 1.5'. Box Dimensions (LxWxH) 8.5 x 4.5 x 4.2"
DT 18-250mm f/3.5-6.3 Lens is rated 4.7 out of 5 by 105. Rated 5 out of 5 by Ron the road cyclist from GREAT lens, I HIGHLY recommend it I had the Carl Zeiss 16-80 which is an excellent lens, but found I needed more reach when on vacation and didn't want to change lenses while walking around sightseeing and so I did a comparison between the Sony 18-250 vs. the CZ 16-80 vs. the Tamron 18-270. I am here to say the Sony 18-250 provided superior optical quality to the others! It was CLEARLY superior in color and clarity to the Tamron and even sharper in clarity to the CZ which was a surprise to me! This will now be my walkaround lens of choice. The lens lock is a nice feature as well to prevent lens creep while walking around. I use it on my Sony Alpha 55. Rated 4 out of 5 by IBR3 from Very good for what it is. This is my first Sony lens. All others are Minolta. I got this for my A700 and a trip to RMNP, CO. I wanted a light lens for hiking to shoot the wide scenics and also be able to get close to the wildlife, when needed. This did the job perfectly. I had already heard great things about the IQ, and it didn't disappoint. My only complaints might be that the zoom on my copy is very firm, but that does eliminate zoom creep. And compared to my Minolta lenses, the AF is slower and noisier. Overall, a very good lens for what it's trying to accomplish. A light, small, one lens solution for most everday or travel situations. Rated 5 out of 5 by jrundog from Perfectly clear shots I needed a walkaround lens for my Sony A300. I could not have chose a better one. I am amazed at how sharp the pics are that I obtain. My Sony A300 has anti-shake built into the body, allowing handheld shots at very slow speeds. So in low light situations I I can obtain nice exposures without sacrificing sharpness with this lens. In good light, usually I can snap something in an instant, and count on a sharp exposure. The combination is terrific, both for close-ups and distance photography. So far I have no complaints and the lens lock is a very useful feature. Rated 5 out of 5 by Anonymous from Excellent 1-lens solution Recently purchased the Sony A350 (body only). I heard the kit lens is pretty mediocre so I was looking for a substitute. Read several reviews about the SAL18250 and I have heard good things. So I decided to give it a try. The lens sure doesn't disappoint. The construction is solid, and it feels just right when put on the A350. Photo quality is very good. There are some CA on both the wide end and telephoto end, but they can be easily fixed by stopping down the lens. And with the focal length this lens covers (27-375 35mm equiv. ), it's perfect for travel when space and weight are limited. Rated 4 out of 5 by jdkphotos from Great lens.....but.... I am a wedding photographer and have found this lens to be a good over all lens. It keeps me from swapping lenses and allows me to have wide angle on my second camera body. Photos are sharp at all zoom levels and does not weigh down my camera. The only problem I have with it is when it comes to filters when the lens is wide open they can see parts of it in each of the corners. The one they try to sell you with this lens has that problem. There are thinner ones out there but they cost a lot more. Rated 4 out of 5 by Anonymous from Good travel lens Small light weight a great travel lens. I also have the Tameron 18-270 which is very similar. The Tameron has a faster auto focus and a slightly longer telephoto. The reason I got the Sony is the lens is less prone to extend by itself as you move around. You are obliged to lock the zoom on the Tameron and you don't really need to do that on the Sony. And when you lock the zoom, you can miss photo opportuniites as you fiddle around to unlock it. I wish it had more of an interior design and did not extend so much. Rated 1 out of 5 by Colonel from CAUTION ON SONY 18-250mm LENS Sony only has a warranty of 1 year for this lens. I had this lens for 2 years when suddenly the autofocus failed. When I called Sony their response was to buy an extended warranty plan next time. Says a lot about their quality and support. I take exceptional care with all my photo gear. Paid $ for a lens I can no longer use. Tamron gives a 6 year warranty on their lens. Recommend getting the Tamron 16-300mm or the 18-270mm lens or Sigma lens instead of Sony. B+H is the best. Rated 5 out of 5 by John from Nice SHARP lens I ordered this lens after reading reviews that it was much sharper than Sony's 18-200 f3.5-5.6. I've just finished a head to head comparison at 100% crop, admittedly very challenging, and found it astonishingly sharp. It's the lens I've been looking for the last two years. With the assistance of the flash, it focuses in an almost totally dark room in about three seconds; also a big improvement. So what's bad about it? It costs money? I&rsquo;m confused. Is this lens compatible with the A99 II? It says on this website that it isn&rsquo;t compatible with full-frame cameras (of which the A99 II is) yet on the Sony website it says that this lens is compatible. Some clarification would be great. Thanks. Hi Matt, the DT 18-250mm lens is compatible with the A99 II with some exceptions. 1) ADI Flash metering is available in combination with HVL-F58AM, F42AM, F56AM, F36AM, KONICA MINOLTA 5600HS(D), 3600HS(D) and 2500(D). 2) When you record movies with autofocus, the operating noise of the lens may be recorded. 3) The angle of view will be narrower down to that of APS-C size. 4) There is no support for hybrid phase detection AF. Hi. I&rsquo;m getting mixed messages. This lense will work with the Sony a99 II right? This website tells me that this lens isn&rsquo;t compatible with full frame cameras, of which the a99 ii is, yet the Sony website says it is compatible. Please advise. This lens is compatible, however the A99 II will be shooting in an APS-C mode. This lens will not cover the full frame of the A99 II, but you can still use it in a cropped sensor mode. 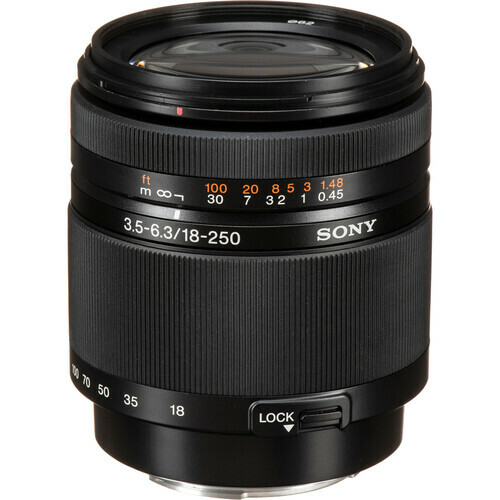 Will this lens fit my sony a55? I use this lens with an a77. If the a55 is a full size DSLR, I can't imagine it wouldn't work. Is this compatible with the Sony Alpha 65? Does this lens have its own focus motor? Or, does it use the body's screw drive? It uses the screw drive. Have had this lens for a little over 3 years, I love this lens, for some reason, the lens will stay in auto focus until I pass 70MM, tHave had this lens for a little over 3 years, I love this lens, for some reason, the lens will stay in auto focus until I pass hen it will not auto focus, have Have had this lens for a little over 3 years, I love this lens, for some reason, the lens will stay in auto focus until I pass to put it in manual to focus it, anybody, else have that happen? will it fit Alpha 7II? No. This is an A mount lens. The Sony a7II is an FE mount. Is this compatible with Sony Alfa 7s camera ? Sorry, but I just saw this. Probably too late to reply now, but the A7s takes an E-mount lens. This is an A-mount lens. Of course it works with the A77, as that is an A- mount also, but the A77 and A7s are not the same thing.